Parcel D of the Public Market project will include 223 apartments, 25 of which will be priced affordable. When the Emeryville City Council voted to increase the city’s affordable housing requirements for developers in October, some observers said the city would be discouraging major projects by making new market-rate housing less profitable. In spite of this, the city council increased its affordable housing impact fee on market-rate units from $20,000 to $28,000, currently the highest in the East Bay. Furthermore, under the previous rules, developers who didn’t want to pay the $20,000 impact fee could instead make 6.9 percent of the units in their projects permanently affordable to lower-income renters; the city council increased this to 12 percent. 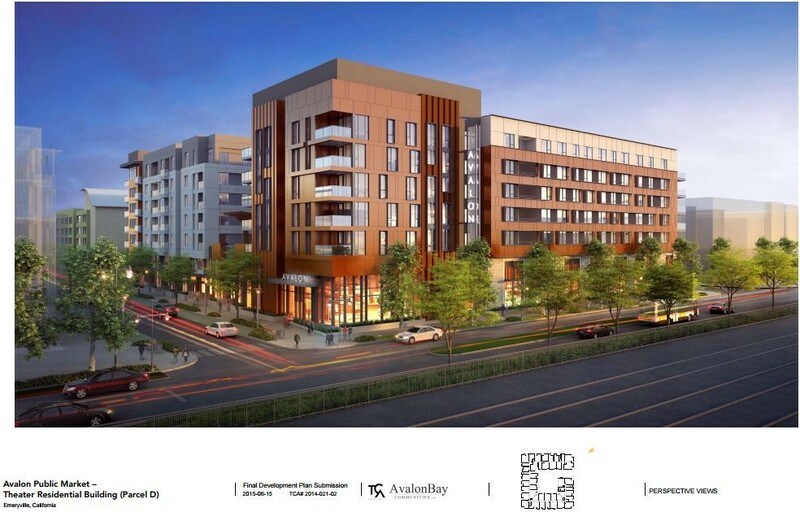 Last night the Emeryville city council finalized a deal with City Center Realty Partners to build a 456 unit apartment complex with 50 affordable units, about 11 percent of the total. The city's new, higher impact fee and on-site affordable requirements don’t actually take effect until December 19, but the development agreement with City Center Realty Partners roughly mirrors the new fee level, the new in-lieu affordable percentage, and other strengthened development rules. The deal may be a sign that developers are willing to pay more into affordable housing for the right to build in Emeryville's market. The Public Market Project has been a long time in the making. It was first approved in 2008, slowed due to the Great Recession, and then revived in 2013. It’s a complex project, involving realignment of a street and redevelopment of a public park. In July, the city council was presented with a plan to build 462 apartments plus retail on the Public Market site. The council tabled the proposal because it would have only included 33 affordable housing units, or 6.9 percent of the total, and also because the city’s “family-friendly” policies encouraging the construction of two- and three-bedroom apartments would have been eased, and few large apartments would have been built. Since then, the council increased their affordable housing impact fee and strengthened other development policies that require developers pay more for the right to build in Emeryville. According to Emeryville’s Community Development Department, there are ten major projects in the development pipeline, in addition to the Public Market, that will have to comply with the city’s new rules. These projects include at least 775 units of housing, which could eventually generate as much as $21 million for the city, or 93 affordable units on-site. Instead of slowing development, Asher said she is concerned that the impact fee will only raise money for the city, rather than pushing developers to build affordable housing in their projects. “My worry is that people are going to be writing us checks, and the fee isn’t high enough to get the on-site units which is what we’d really prefer.” According to Asher, the Public Market project was unique in that the city had leverage over the developer in the form of land and permission to realign streets. This allowed the city to gain affordable housing in the project instead of merely collecting the impact fee payments. City Center Realty Partners did not return phone calls seeking comment about the deal.